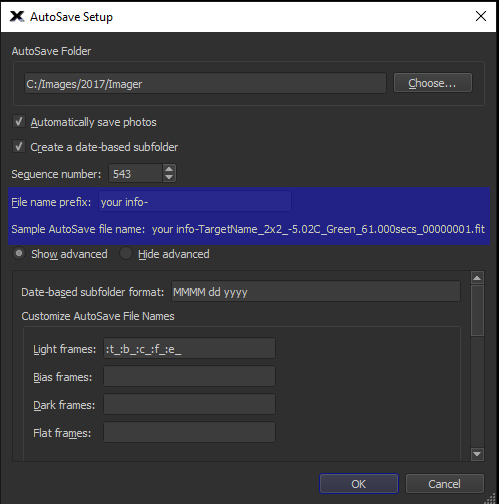 Some quick tips on the Autosave function for images and logs in TSX. 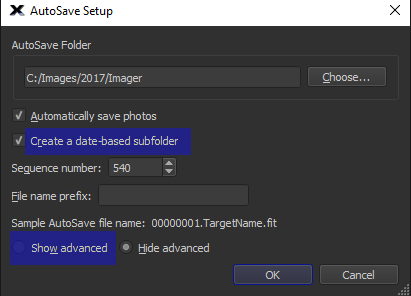 When you click ‘Automatically save photos’ or ‘Log autoguiding’ from either the Camera tab or Autoguider tab you also should click the Autosave… button to set the folder where your images (and logs) will be saved. The Autosave folders are different for the camera tab and the autoguide tab. One way to make things a bit easier is to designate a folder for each that is easy to find or you can have each navigate to the same folder if you want. In this case separate folders were used: c:imagescamera and c:imagesguider or whatever works for you. This way the images you save are in the folder you choose and can be found easily. Keep in mind the log files are saved to these respective folders as well, Image.log or autoguider.log (depending on the tab you’re using this will determine the log name, example if you’re autoguiding via the camera tab the log will be imager.log). You’ll need the log files if you’re doing PE data (typically imager.log) collection or having a look at the autoguide log. Here is a look at the folders, each populated with an image and a log file, again you can name them in any way that suits you. Now that you have the folders set up you may notice a date based sub folder that the files populate. You can enable the date based folder by ticking the box ‘Create a date-based sub folder’. You should also tick the show advance radio button as well. Here is the box to enter the date based info, you can use yyyy mm dd or any combo from the date code box below. 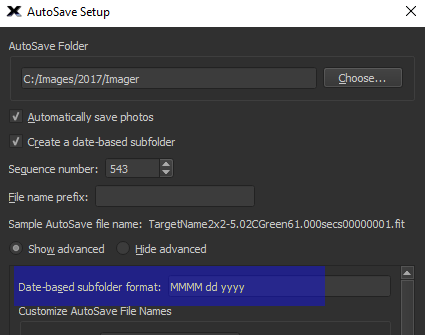 Once you have the date set up it’s time to customize your image file names with the macros that will help you identify what you have at a glance. 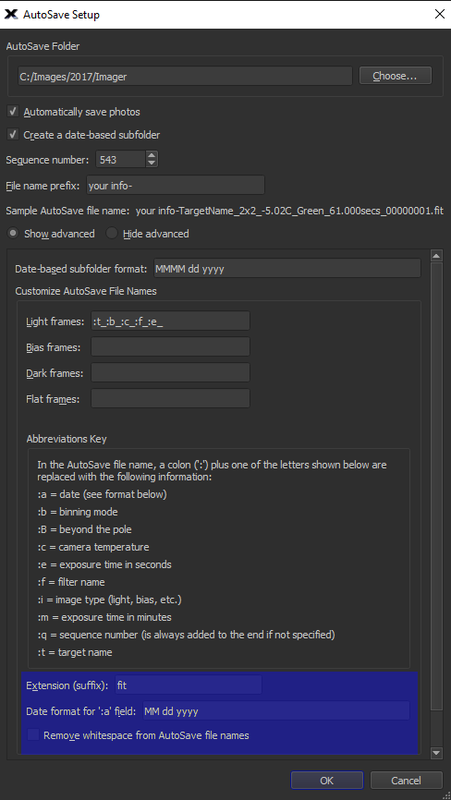 You can see the Abbreviations Key near the bottom of the Autosave setup window. Very straight forward, just use a colon (:) to start and separate the letters. 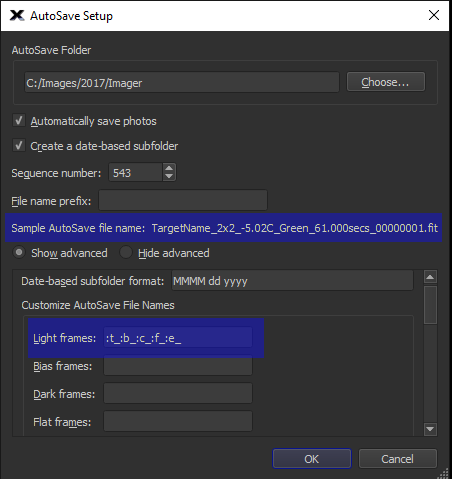 You can see a sample generated “Sample Autosave file name’. The sample looks a bit crammed together, we’ll deal with that in a bit. 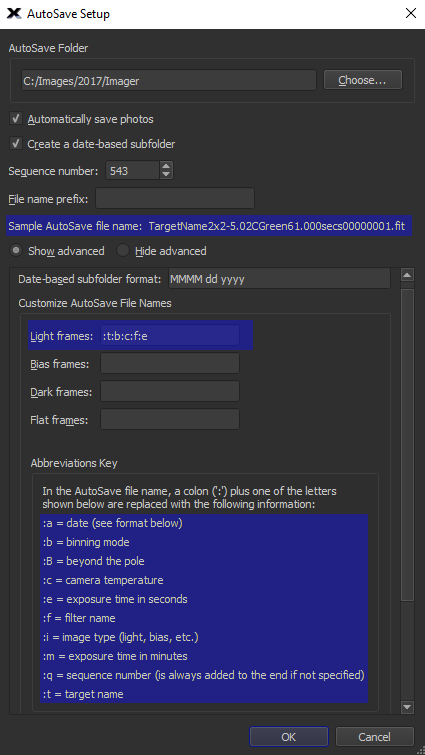 You can generate the custom file names for Light, Bias, Dark and flat frames by inserting the appropriate letter(s) in the corresponding box. To fix the crammed together look go ahead and add a hyphen (-) between the letters as shown in the sample, this gives some spacing so the file name is easier to read. An underscore (_) works just as well depending on what you like, any other character should work as well, try what you like. You can add a prefix, anything you want, end it with the hyphen or underscore or the character of your choice to give it the spacing required for easy reading at a glance. 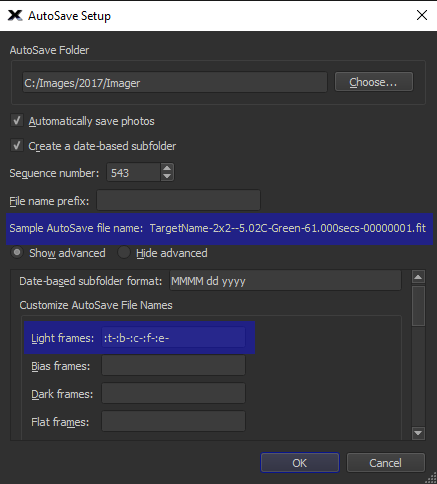 You can change the file extension, (normally just leave it as fits unless you’re using a DSLR) Date format for the :a field (if you want a date in the file name) and you can also remove the white space from the Autosave file names. This helps if your OS has an issue with a space(s) in the file name. That’s it, hope this helps!